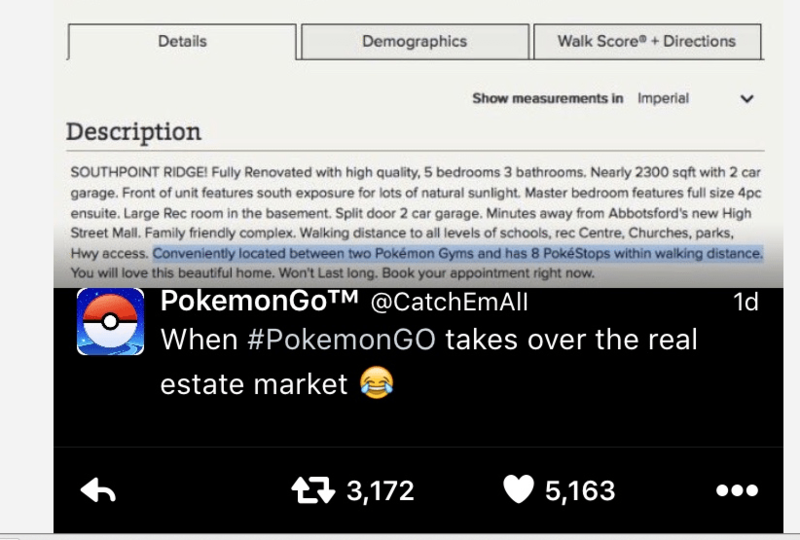 Pokémon Go Is Everywhere -- And Sneaking Into Real Estate? Pokémon Go is everywhere -- is there a real estate angle? The late '90s and early 2000s Japanese anime cartoon Pokémon has resurfaced with the augmented reality game Pokémon Go. Pokémon Go brings the world of Pokémon to life, and allows players to catch elusive Pokémon everywhere — in their house, their backyard, or even in public places such as their neighborhood, local parks and stores. Pokémon Go might work its way into real estate listings, with sellers boasting about the number of Pokémon training gyms and PokéStops in their neighborhood. Some agents have already begun using the game to draw in potential buyers at open houses. Real estate listing descriptions can be a fascinating reflection of regional character and culture. Idaho loves its soaker tubs, while Alaskans can’t get enough Southern exposure. The latest trend taps into a quirky cultural phenomenon that has resurfaced since its beginnings in the late ’90s and early 2000s — Pokémon. Pokémon is a Japanese anime cartoon that debuted in 1997, and took us into the magical world of Ash Ketchum, a young boy who wanted to be the greatest Pokémon trainer of them all. From there, the brand expanded into apparel, card and video games, books and even the silver screen. For those new to the game, Pokémon are fictional creatures that humans (aka Pokémon trainers) catch and then prepare for battle. The little monsters have unique names such as Charmander, Squirtle and, of course, Pikachu — the game’s brand ambassador — and come with their own set of strengths and traits. But you don’t need to know that to enjoy the game. In fact, most people don’t. The Pokémon craze fizzled a bit when millennials started to grow up and move on to other obsessions — such as Facebook, selfies and twerking. But, over the past week, Pokémon resurfaced with a new game, Pokémon Go, and claimed the hearts of millennials and others alike, who were in need of some nostalgia after a hard week. Pokémon Go, available on Android and iOS, brings the world of Pokémon to life with augmented reality and challenges players to travel around their neighborhoods and cities to catch Pokémon and battle other trainers at Pokémon gyms — there are more than five in my Oklahoma City neighborhood alone. Pokéstops — where users can collect free (virtual) items that power their Pokémon — along with actual buildings designated as “gyms” are high-traffic areas within the game and get players out of the house walking around in the real world. Pokémon Go surpassed Whatsapp this week in average number of engaged minutes per day. And just like any other trend — Snapchat, Periscope and Facebook Live — Pokémon Go has found its way into real estate. A listing in British Columbia, Canada. For nerds the world over, this hot listing feature might be just what they’re looking for right now. The game has actually found its way into a Craigslist ad. 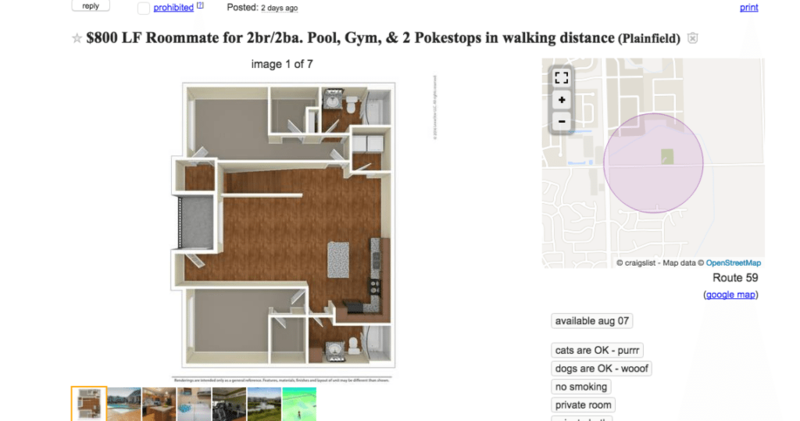 This apartment is located between two Pokémon gyms and has eight PokéStops within walking distance. Who could pass that up? A real Craigslist ad posted 2 days ago. 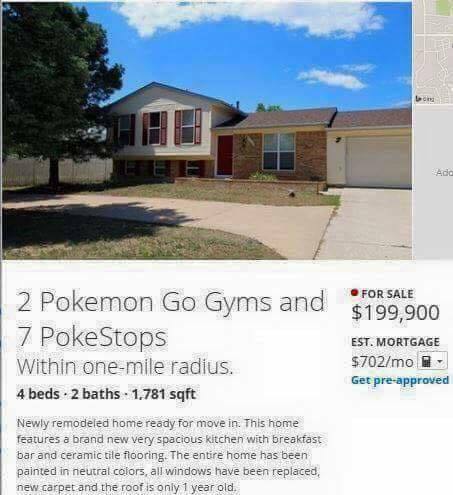 Moerover, a viral Zillow “listing” — which appears to be a meme — boasts two, yes two, Pokémon Go gyms and seven PokéStops that would be heaven for any aspiring trainer who is looking to “catch em all” in their neighborhood. The members of Lab Coat Agents (LCA) quickly caught onto the craze and discussed how the game is now being used to sell homes. 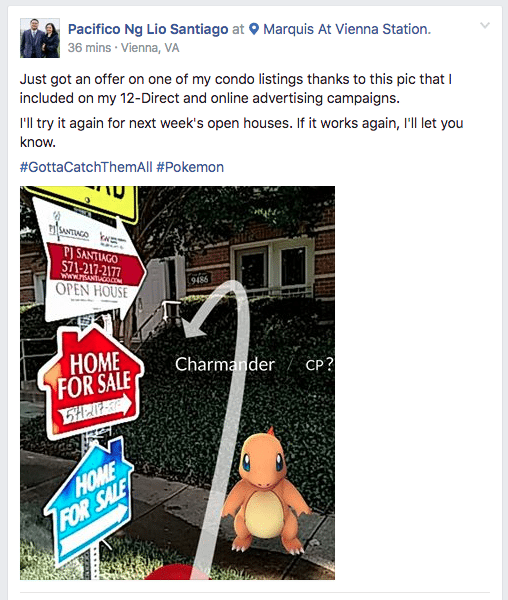 Some agents on the thread were still trying to figure out what Pokémon is, while others had already caught on and started using it in Facebook ads for open houses. Mandy Panozzo-Clay says she used Pokémon Go as a way to attract potential buyers at an open house in a young, hip area of her town. “It was super basic. It was in our town’s ‘hip’ page with a link and photo of the house I was having an open house at and it said ‘looking for Pokémon? 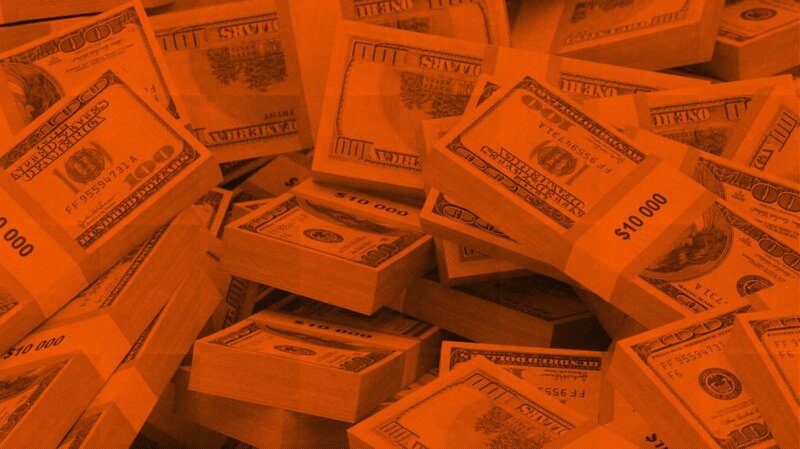 We have plenty here at…,'” says Panozzo-Clay. On the flip side, the app poses a few real-estate related risks, as shown by the man living with his wife in a converted church in Massachusetts. Turns out, Pokémon Go has designated many churches as “gyms” — so the couple had an onslaught of gamers flocking to their property. Potential buyers who’d rather not deal with the commotion could be deterred by the game’s neighborhood impact. In addition to safety risks, Lab Coat Agent member Greg Lyles warned fellow agents about using Pokémon Go snapshots in social media and print ads — they could result in possible copyright infringement violations that come with a hefty maximum fine of $150,000. “It may seem like a lot of fun to include the characters in your ads, but you are subjecting yourself, and your broker, to a potential copyright violation lawsuit,” says Lyles. Pokémon Go is part of the Pokémon site, so it seems that the rule would apply to using game images for advertising. Although it would seem unlikely for the Pokémon Company International to start slapping real estate agents with lawsuits, it is a risk to consider before making an ad. Inman Ambassador Stacie Perrault Staub made a post on her individual page, predicting that real estate agents will soon be capitalizing on this game with seminars. Staub also offered some insight on whether this trend will prove its longevity in real estate or die off as quickly as it started. “I think Pokémon Go has the potential to spark innovation along the same framework as the game, by targeting real estate consumers as a way to spur interaction, facilitate live real estate events like open houses and neighborhood tours, etc.,” Staub told Inman. Whatever the future may bring, catch all the buyers you can before Pokémon Go goes away.